VATICAN CITY (CNS) — Pope Francis called for a special Synod of Bishops to focus on the Amazon region not primarily because of the rainforest’s key role in the ecological health of the planet, but mostly because he sees pastoral needs there that require special attention. In fact, while globally there are 3,130 Catholics for every Catholic priest, in South America the average priest serves 7,203 Catholics, according to Vatican statistics. The Amazon rainforest covers more than 2.1 million square miles in South America and includes territory in Brazil, Ecuador, Venezuela, Suriname, Peru, Colombia, Bolivia, Guyana and French Guiana. The Catholics-to-priest ratios in Venezuela (9,829-to-1), Peru (8,427-to-1), Bolivia (8,038-to-1) and Brazil (7,976-to-1) are even higher than the continental average. 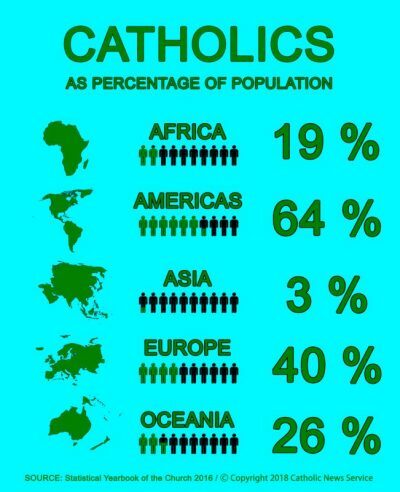 In the United States and Canada, for comparison, the Vatican estimates that there are 1,916 Catholics for every priest. The Amazon synod will be held at the Vatican in October 2019; the preparatory document for the gathering was to be released by the Vatican June 8. The Catholics-to-priest ratio is just one table in the Statistical Yearbook of the Church, which is published annually by the Central Statistics Office, a department of the Vatican Secretariat of State. With more than 500 pages of figures and charts, the yearbook tracks everything from Catholic population to the outcome of requests for the declaration of the nullity of a marriage. The figures are the result of information requested annually from every diocese and church jurisdiction. Collecting and compiling the figures takes more than a year. The volume with statistics valid as of Dec. 31, 2016, was published this spring. Worldwide, there are more than 1.29 billion baptized Catholics, according to the volume, and that means the Catholic population is holding steady at about 17.7 percent of the global population. In addition, it estimated that another 4.9 million Catholics live in church jurisdictions with which the Vatican has no “regular exchange of information.” Most of those 146 dioceses, prelatures and prefectures are in mainland China. Thirty years earlier, the 1986 yearbook estimated there were as many as 15 million uncounted Catholics living in 214 jurisdictions that did not or could not report to the Vatican. The figure included Catholics in China and in most of what was then the Soviet Union. For the year ending Dec. 31, 2016, the world’s 1.29 billion Catholics were served by: 5,353 bishops; 281,831 diocesan priests; 133,138 religious order priests; 46,312 permanent deacons; 52,625 religious brothers; 659,445 religious sisters; 345,743 lay missionaries; and close to 3.1 million catechists. Globally, the number of bishops, diocesan priests and permanent deacons all were higher than a year earlier. The number of religious order priests and brothers, religious sisters, lay missionaries and catechists all declined. The increases and decreases, though, are not consistent across every continent. For example, the number of diocesan priests in Africa and Asia rose significantly over the course of 2016. Numbers were up slightly in Latin America and Oceania, but dropped slightly in North America and Europe. According to the yearbook, only North America and Europe had fewer diocesan priests in 2016 than in 2005. The Statistical Yearbook of the Church also tracks the number of baptisms and Catholic marriages in the world. In 2016, more than 16.2 million people were baptized and more than 2.4 million were married in a Catholic ceremony. The yearbook for 1986 had reported more than 17.8 million baptisms and more than 4 million Catholic weddings. To get an idea of how Catholics are practicing their faith, the Vatican also looks at the rate of marriages and the rate of baptisms of children for every 1,000 Catholics. The rates “enable us to note the differences between one country and another and, when examined over successive periods, to follow the evolution of the ratio,” the yearbook stated. It cautioned, however, that the “general downward trend in the relative number of baptisms” does not always indicate a declining practice of faith, but closely follows the trend of a lower birthrate in many countries. Globally in 2016, there were 10.2 baptisms of children under the age of 7 for every 1,000 Catholics. The rate in the United States was 9.6, while in Canada it was 5.3. Argentina held the record for South America with 12 child baptisms for every 1,000 Catholics. The Pacific islands of Samoa, Solomon Islands, Tokelau, Cook Islands and Nauru ranged from 23.5 baptisms per 1,000 to 41.6. The struggling Christians of the Middle East had a rate of 4.9, in Africa it was 13.7 and Europe registered 6.6. The rates of child baptism were lower than they were 30 years ago. The Statistical Yearbook for 1986 said globally 18.9 children were baptized for every 1,000 Catholics. The rate in the U.S. was 17.6, and in the Middle East, it was 11.9. One figure that has not changed much in the past 30 years is the percentage of the world’s bishops who lead dioceses in a country other than the country of their birth. In 1986, 16.7 percent of the world’s 4,027 bishops were “foreign to country of residence,” the yearbook reported. In 2016, about 16.6 percent of the bishops were ministering outside their native land.